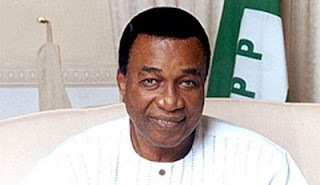 A former governor of old Anambra State, Jim Nwobodo, has denied media reports that he collected the sum of N500million from the former national chairman of the Peoples Democratic Party, Ahmed Muazu. Many chieftains of the former ruling party were fingered in the sharing of slush funds allegedly distributed by a former National Security Adviser, Sambo Dasuki and a former Minister of State for Finance, Bashir Yuguda. Messrs. Dasuki and Yuguda are currently standing trial on charges of corruption. But in an interview with Premium Times on Wednesday, Mr. Nwobodo said he only received the sum of N100million from the PDP for “campaign logistics” not from Mr. Dasuki. “I have never met Sambo Dasuki. I know Yuguda as former minister, that is all. What happened was that I was invited alongside 15 leaders of PDP in the South East to the residence of Ahmed Muazu to collect the money allocated to our zone by the PDP. “Three party leaders were selected from each of the five states of the South East. I was selected to lead a committee of 15 to collect the N100million, which was shared to each one of us for campaign logistics in our respective states. Mr. Nwobodo, who is currently in New York for treatment, said his party, not former party chairman, Mr. Muazu gave him the money. “I was surprised to hear that a report quoted me as saying I collected N500million from Muazu. This is sheer lie as I have never previously spoken to any journalist on this issue but today. So how come somebody concocted a figure and attributed it to me? “It was PDP as party that shared the money for campaign not for our individual use,” he said.